Dubai: Dubai Police have turned old, tired surplus “armored vehicles” into a sea floor haven for exotic Gulf fish. Several years ago, when faced with the fact of having to dispose of 15 armoured vehicles, the police came up with a novel idea. Why not put the vehicles to a better use rather than scrapping them? Why not scrub and clean the vehicles and sink them to the ocean bed and enable them to be the starting point for a new artificial reef? It sounded like a plan. And the Police Armoured Vehicles Artificial Reef project came alive. Lt Col Dr Tamim Al Haj, Director of the Environment, Health and Safety Department at Dubai Police, said that Dubai Police are the first known security organisation in the Middle East to carry out such a plan to help rejuvenate marine life. 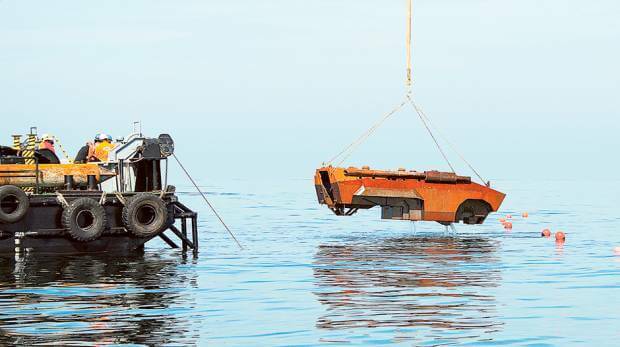 Lt Col Al Haj said that the idea to sink the vehicles was the brainchild of Major Obaid Mohammad Al Shamsi, Director of the Property Management Department at Dubai Police, who in 2012 suggested they use the armoured vehicles’ skeletons to create an artificial reef. He had read about similar projects that had been a success in other countries. “The idea was approved by Dubai Police, and the Dubai Police Environment Health and Safety Department led the project, working with the Dubai Municipality to pick a location for the project,” Lt Col Al Haj said. After two months of research, and the approval of the Dubai government, Dubai Municipality chose a location near The World Islands in Jumeirah for the project. “We followed all the environmental requirements, which is to remove the vehicle’s tyres, paint, engines and oils and grease. We used [the expertise of] diving teams and equipment such as cranes from the Transport and Rescue Department to sink the armoured vehicles, a task that took an entire day,” Lt Col Al Haj said. In less than three months from the time the vehicles were planted on the ocean bed, Dubai Police divers checking on the progress of the project saw that fish had started to inhabit the area. “The area had no fish [to begin with], which is why the municipality chose it. [Soon] we started seeing new species of fish. In less than a year, the artificial reef was home to 17 kinds of fish that did not live in that area before, according to a report done by Dubai Carbon,” Lt Col Al Haj said. Hamour (orange-spotted grouper), sherri (Spangled Emperor), Farsh (Painted Sweetlips) and Jash (Trevally) are some of the fish that call the area home. The project now covers an area of one nautical mile. Lt Col Al Haj said that there has been an agreement with United Nations office in the UAE to get international experts in artificial reefs to visit the project and measure its environmental impact and issue an official report. After the success of the artificial reef in 2012, the department noticed that there isn’t a lot of coral in Dubai waters, which can affect fish stocks. Major Al Shamsi, who suggested the artificial fish reef, proposed the idea of a coral nursery after researching best practices in other countries. “We did further research and joined efforts with the Ministry of Environment and Water, who gave police personnel a course in coral farming in Umm Al Quwain and, with Nakheel’s help, the ministry chose a location for the nursery,” he said. The location is next to Palm Deira on an area of 55 square metres and the project was started in 2013. All the frames and the equipment used for the project were manufactured at Dubai Police’s workshops. “From the early stages of the project, we noticed fish moving to the area, because fish feed on coral,” Lt Col Al Haj said. 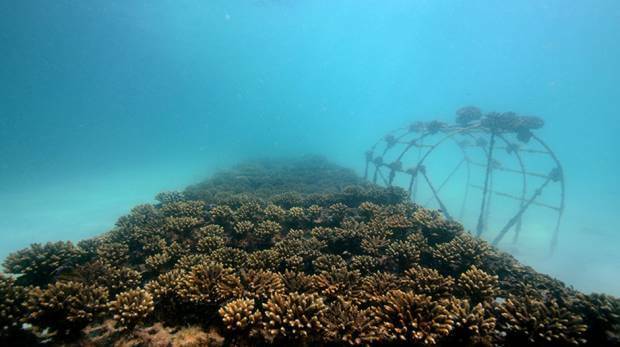 The coral nurseries were a success, as they grew 15cm in a year, a very good rate as the average coral growth rate is 7.5cm a year, according to a report by Dubai Carbon. He said they have recently started testing the ‘biorock’ technology, which uses solar power to speed up coral growth to five times its normal rate. Some of the marine species that have made the new coral their home include an octopus, angel fish, yellow-spotted boxfish, different species of prawn and shrimps, Painted Sweetlips, orange-spotted grouper and surgeon fish. He said that Dubai Electricity and Water Authority (Dewa) wanted to be part of the project, and sent some of their Carbon Ambassadors to Dubai Police to learn how to grow coral. “The project was also visited by Sue Holden, Earth Watch’s Europe and Middle East CEO, and Nigel Winser, Executive Vice-President of Earth Watch Institute Middle East and India, who said that the project has big potential for publishing two scientific papers,” Lt Col Al Haj said.